Possibly the biggest threat to rabbit welfare right now is the huge upsurge in unlicensed breeders appearing on classified ads on the internet. These breeders are not subject to any regulations, legislation or welfare checks and they provide no care advice to their customers. On top of this, it is thought that many of the rabbits sold in this way are bought for meat. To tackle this problem, the RWAF launched the Capone Campaign in December 2015. By way of explanation of the name: The Federal Authorities were unable to catch Al Capone on the simple charge of ‘running a crime syndicate’ so they had to get creative and used the laws they could prosecute him on. Capone was eventually found guilty of tax-evasion. We find ourselves in a similar position, it is not illegal to sell rabbits without a license, so we are following Elliot Ness’s example and using the laws that are at our disposal to make it as difficult as possible for these breeders to do business. DEFRA guidance states that if a trader is a pet shop by any other name then they should be subject to licensing conditions and everything that goes with that. DEFRA have given the responsibility to local authorities to decide on the balance of evidence whether an online trader is operating as a business selling animals, or keeping animals with a view to them being sold, as pets. The Capone Campaign works like this. We trawl through the online ads, identify what look to be unlicensed pet retailers and provide evidence to the relevant local authority. Gather information to build a sound basis for lobbying for better welfare or resources in local authorities. With the help of amazing software designed by Hindesight, we have been able to analyse thousands of ‘rabbit for sale’ adverts from sellers who have advertised more than five times on one site in a year. We have reported over 40 sellers to their local authorities and have received a wide range of responses. Disappointingly, where we have had a response and the local Authority have paid a visit, the majority of officers are citing a ‘hobby breeder’ exemption for not licensing. This is very frustrating. The interpretation being applied in this case is that if someone is breeding from their pet they are exempt and also if someone is breeding for showing and selling off their surplus stock (that they don’t require for showing) they will also be exempt from licensing. The term hobby breeder is a real problem as it is allowing individuals to sell a large number of animals while staying under the radar of the authorities both from a licensing and a tax point of view. We have reported this to DEFRA, as we do not agree with this, and we are waiting for their official response. In the last month however, we are delighted to have had two positive outcomes from our reports, and two sellers have been licensed by their local Authorities. This means they will be inspected annually, and will have to follow set conditions that should improve welfare. It will also be a warning to other back yard breeders. 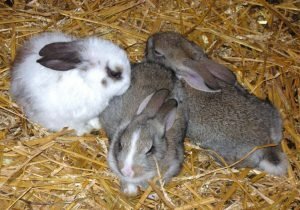 An Officer from Wakefield local Authority has issued a Pet Shop License based on our evidence highlighting a large number of adverts advertising different breeds of rabbits for sale from one location. We are really pleased with the thorough investigation this local Authority gave to our evidence and the fact they have interpreted the legislation in an up to date and effective way. We are also pleased to say that Poole local Authority have also issued a pet shop licence based on our reports. The volume of rabbits being sold on the premises gave weight to the seller needing to hold a licence and we are grateful that our information was taken seriously and a positive outcome achieved. We are hoping that these two examples will be able to set a precedent for local Authorities to interpret the act in a way that reflects what is happening in today’s society and in the cases where this doesn’t happen, we are keen to enter a dialogue with DEFRA with a view to tightening the guidelines. We are eager for a change in the law to help regulate and control online sellers of pets but until then we need to work with the tools we do have. If more sellers can be uncovered and licensed it all helps in the battle for positive animal welfare. In addition, as well as a number of online ads being removed at our request there have been other wins too: An online pet shop that we think have ceased trading since they were investigated, a joint investigation of a private property, based on our evidence, by the RSPCA and local Authority, a breeder who has retired since being investigated and a meat rabbit seller being told he cannot sell or advertise rabbits for that purpose and being given advice on various welfare issues. We always knew this project was going to be a long road and weren’t expecting great results in the first instance so to have these successes under our belt at this stage is fantastic. We will of course continue the battle. We are grateful to Pets Corner for sharing our concerns about this worrying problem and funding this project. 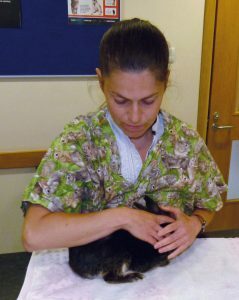 The RWAF has held a list of ‘rabbit friendly vets’ for over 10 years now. We survey every vet that applies to be on the list and our Vet Specialist, Dr Richard Saunders assesses each application individually. It covers a host of areas such as a rabbit waiting area and ward, pain management, diagnosis and the skills of the vet themselves. Those that meet the standard are awarded either ‘Silver’ or ‘Gold’ status and issued with a ‘rabbit friendly’ logo and certificate. We always advise rabbit owners that using a rabbit-savvy vet is vital and our rabbit friendly vet list is a great place to start. The list is constantly being updated, with new vets being added all the time. This is the most up-to-date version of the vets who hold our gold and silver award. The updated list appears on our website or can be accessed by emailing us at hq@rabbitwelfare.co.uk, so if you are looking for a rabbit-savvy vet then look no further. Practices achieving a very high standard of care are awarded gold status. Beaumont Animal Hospital, Royal Vet College, Royal College Street, London, NW1 0TU. Silver status is awarded to good standards of care.